I am not a religious man, but I have a ritual that I perform every day: I wash my breakfast bowl. It doesn’t seem like much, especially in this age of dishwashing machines and takeout food on paper plates, but my ritual has a long and meaningful history. There was a year in my life when I didn’t have a job. I lived with friends in North Carolina and did their cooking and cleaning. Every morning, after breakfast, I washed all the dishes. To others, dishwashing may seem a boring chore, but to me, it was a time to regain contact with the eons. I could stand at the sink with my hands in the steamy suds and stare out the kitchen window at the leaves blown from their trees. I stared out the window as I worked, mentally walking down the path behind the house past the tin-roof barn and the wide rolling field where old Mr. Price grew beans and tobacco. On the far side, there was a brook that meandered into a small ravine about a dozen feet deep, wet on its north, sunless side, and dry on the south. And across the granite that forms the streambed as it cascades through this ravine was a long white stripe of quartz, an igneous dike where molten lava once inched up a joint in the surrounding rock and cooled into quartz bright and shiny against the black of the basalt streambed. 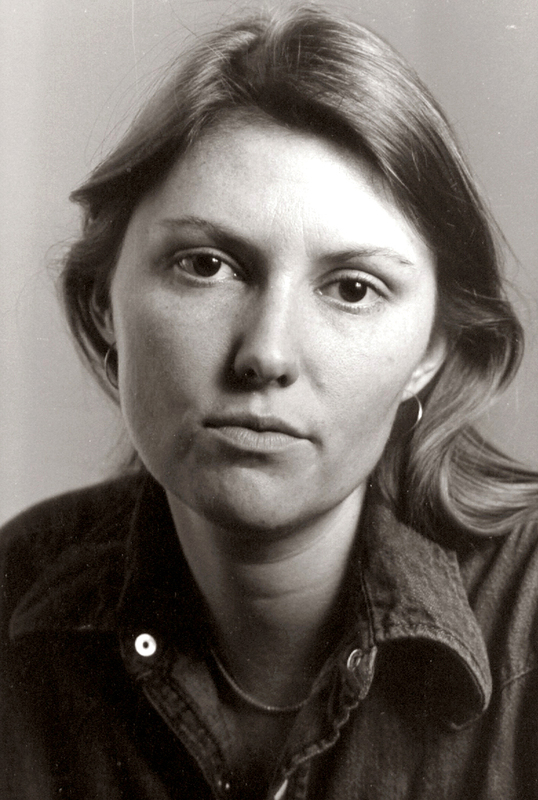 And standing at the sink with my hands glossy with detergent, I could travel upstream into myself the same way, finding, eventually, the glistening evidence of my own deepest thoughts: people I had long forgotten, places I hadn’t remembered being, songs I had sung with my grandmother, and sometimes even peace. And so I rinsed the hot soap from a dish with scalding water and left it in the drain rack. 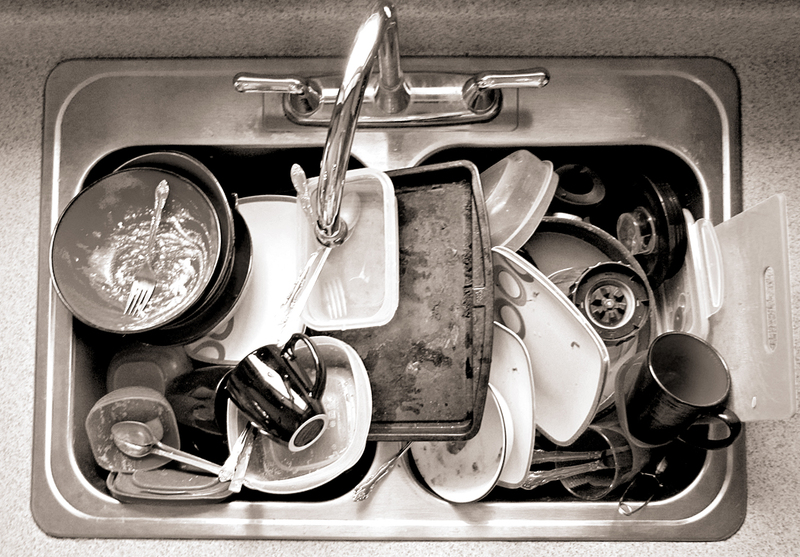 I reached for the next dish and I thought about other times I have washed dishes. I recalled the night my son was born. I had been at the hospital for his birth, in the delivery room as he entered the world screaming and miry. After I had taken the usual photos and Annie went back to her room for some well-deserved sleep and the kid was cleaned off and sent to the nursery, I drove home and found a kitchen full of dishes, greasy and smeared, waiting to be cleaned. Annie had been in labor almost two days and, though I had been with her through most of it, I also had gone home periodically for meals. Those dishes and the ones left over from the dinner at which she started feeling her contractions were scattered all over the house. I filled the sink with hot water and divided up the dishes from the pots and set the plates and silverware into the sink to soak. Steam rose from the suds. I remember that night; I was in knots, loaded with the new responsibility of a child and desperate with the empty feeling that my wife and I no longer could live together. I stuck my arm into the water and my guts began to relax. I rinsed the first plate and my mind went blank – the blankness of meditation. My belly loosened and my teeth, which had been gnashing through the nights as I slept for months, relaxed. I rinsed the next plate, and it clicked against the first as I settled it in the drain rack. Soothing. My problems were not solved, but I could look at the dilemmas I faced without the desperation I had been feeling. 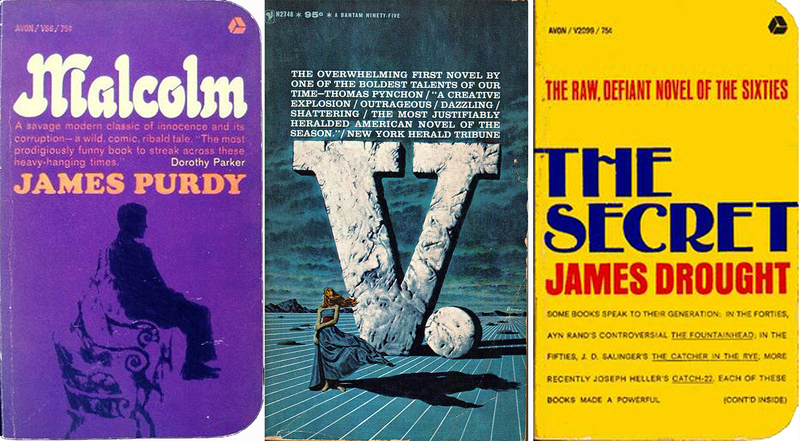 My frenzy abated. I recall camping with the redhead who succeeded my wife. We were staying in an abandoned farmhouse in a hidden valley of the Blue Ridge. Looking out over the balustrade, we saw the cliff across the glade, the rocky stream that poured down the valley bottom, the second growth in the old farm fields, millions of black-eyed Susans swaying in the breeze. As the sun dropped behind the cliff, I took our supper dishes down to the stream and washed them, scouring them with sand from the creek bottom and rinsing them in the icy water. Billions of fireflies made Fourth of July for us. I left the cold dishes on a large rock to dry overnight. I recall once seeing a twisting globe of blackbirds rise from the trees and stretch out like the Milky Way across the sky. 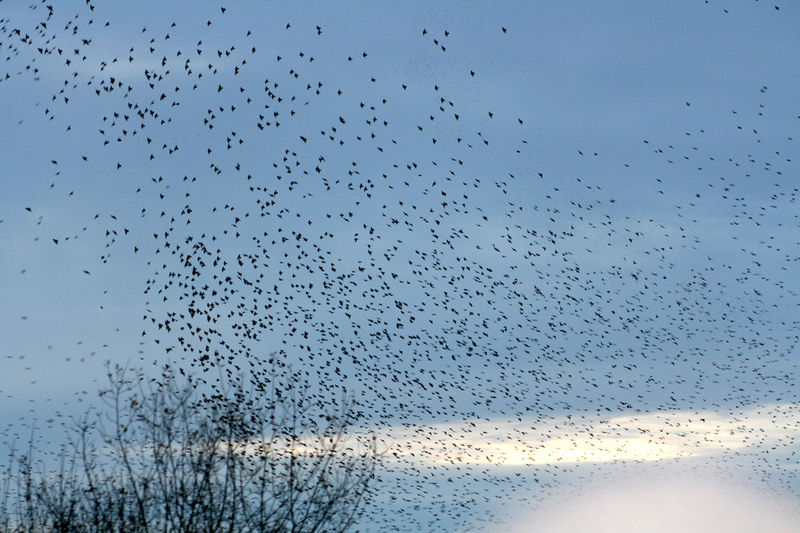 Hundreds of thousands of birds roosting took flight and spanned the evening sky. I dipped the last pan into the darkened suds and scrubbed it. 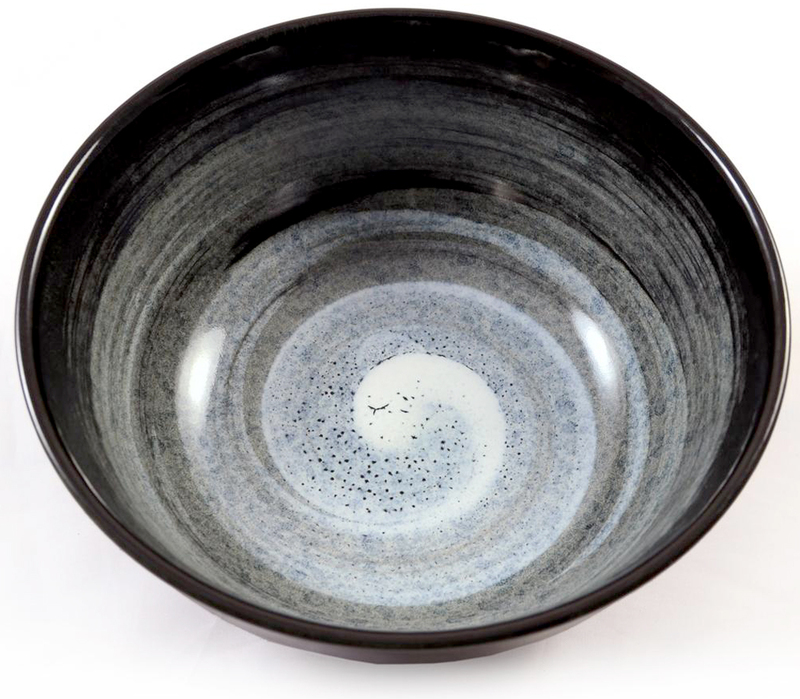 When the student asked Zen master Chao-Chou for instruction, the sage answered, ”Wash your bowl.” All philosophies else try to figure out logical ultimates, leaving us, at the end, only a useless ash. No matter if Plato be right, or Whitehead, or Sartre, the one action that we all share is ”washing our bowl.” No matter if everything Wittgenstein ever wrote is absolutely true, we must act as if he never wrote anything. We still must wash our bowls. If everything is explained, nothing is explained, and we are back on square one. Better to wash your bowl. So, as I wiped the final grease from the stove top and wiped down the counters and cutting board, I replaced the salt and pepper in the middle of the table and wiped off the tabletop. All that remained was to rinse the dishrag and dump the greasy suds down the drain, setting the washbasin out to dry. 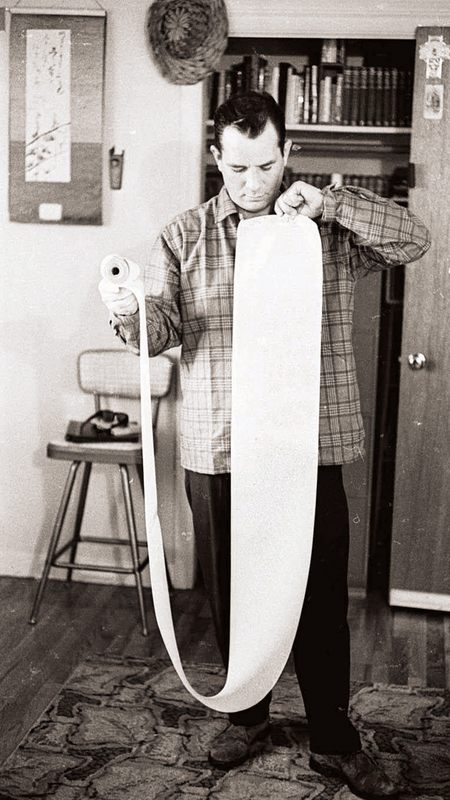 That completed, I dried my hands on a fresh towel and began on one of the day’s other tasks. 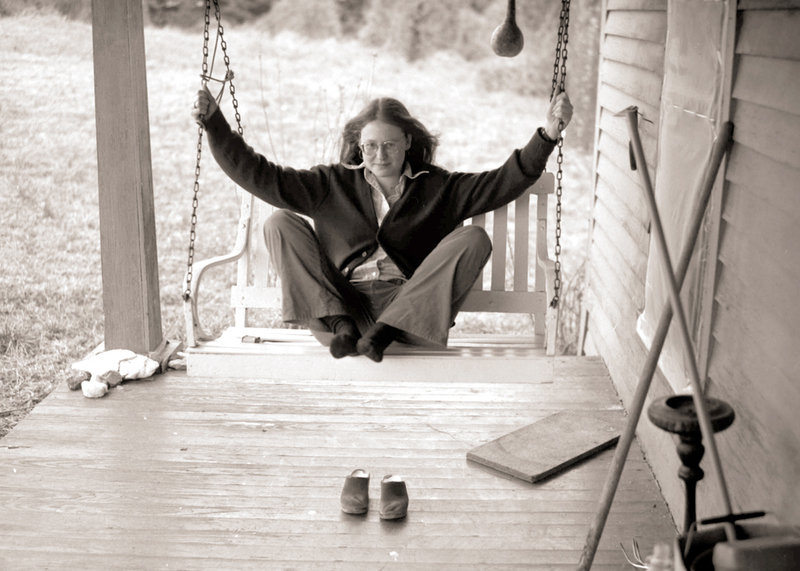 Once, long ago, when I visited a friend, Judy Crawford, no longer with us, at her mountain house up near the Plott Balsam mountains of North Carolina, I cooked her a giant meal of coq au vin and I made French bread. We had several friends over and feasted, making such a pile of greasy dishes that we all agreed to let the mess sit overnight. 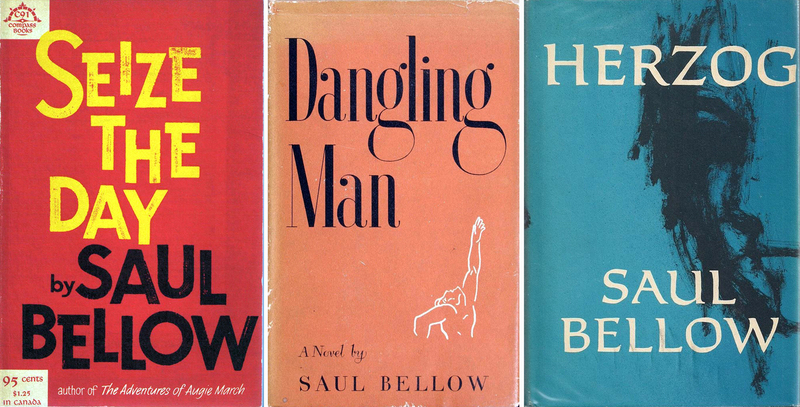 ”I can’t look at the kitchen tonight,” Crawford said. I woke early the next morning and dressed and went downstairs to the kitchen. It was a little after 6, and the sun was hours from rising over the first peak. I filled the sink and started the dishes. Boonie, her cat, crawled around my ankle, looking up at me, squealing for milk. A few robins and a bluebird were scratching at the ground outside the kitchen window. It was quiet – calm and silent. I finished every last dish before Crawford woke up. ”Golly. You didn’t have to do that,” she said when she saw her shining kitchen. No, I didn’t have to, but I enjoyed it. I was at peace. 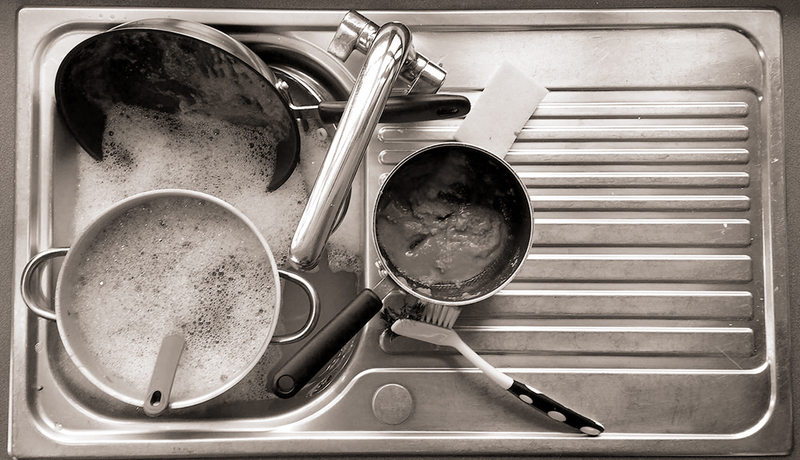 Most of what we do in our lives is frivolous – watching TV, fixing the car, reading books, waiting for the bus – but the washing of dishes is important: It is necessary. And it is something humans have been doing since before the days when Abraham lived in Ur. Washing dishes is part of being human. Ten years ago, the Paris police discovered an outlaw movie theater, complete with bar and restaurant, hidden in a sealed-off old quarry tunnel under the 16th Arrondissement, just across the Seine from the Eiffel Tower. “The whole thing ran off a professionally installed electricity system and there were at least three phone lines down there,” police were reported to say. Every city has an underground. But in Paris, the underground is literal. Ten percent of the city is built above underground caves, tunnels and medieval limestone quarries. When building foundations are constructed, the tunnels have to be taken into account, and since no one in Paris has a complete and accurate map of the tunnels, it sometimes becomes a problem. It is estimated that there are some 180 miles of tunnel beneath the streets of Paris – and that’s not counting the 1,300 miles of sewers or 125 miles of subways. 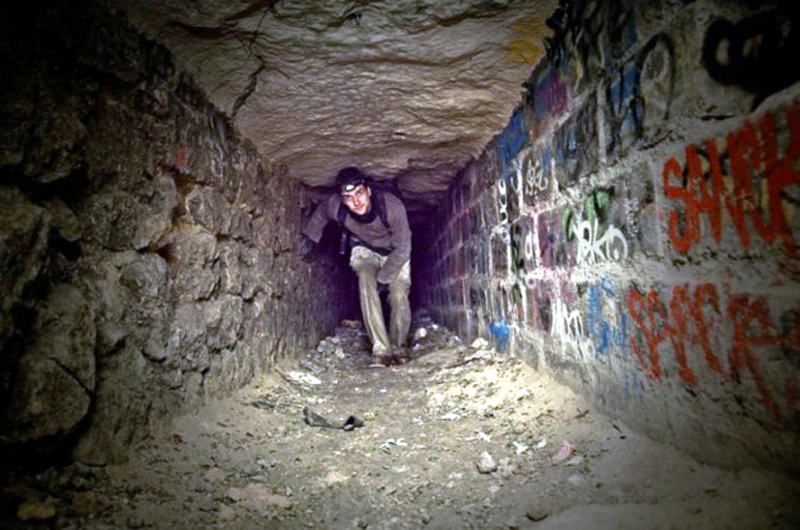 Access to most of the tunnels has been illegal for civilians since 1955, but hordes of young people have been using them for recreation – of various sorts – since they were constructed. Even now, everything from rock concerts to picnics are held in the limestone tunnels by those called “cataphiles,” after the catacombs of the city. Less innocently, they are also the site of many drug deals and other underworld activity. 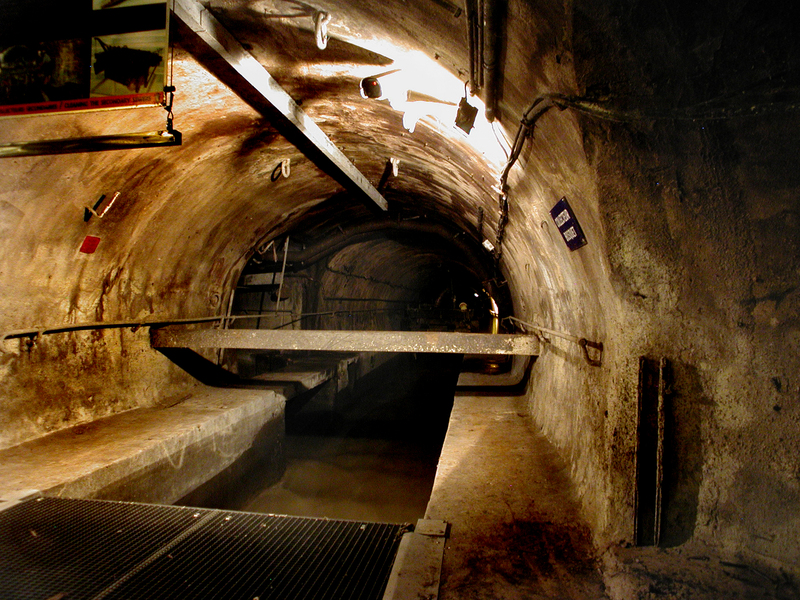 During World War II, the tunnels provided shelter for the Resistance. 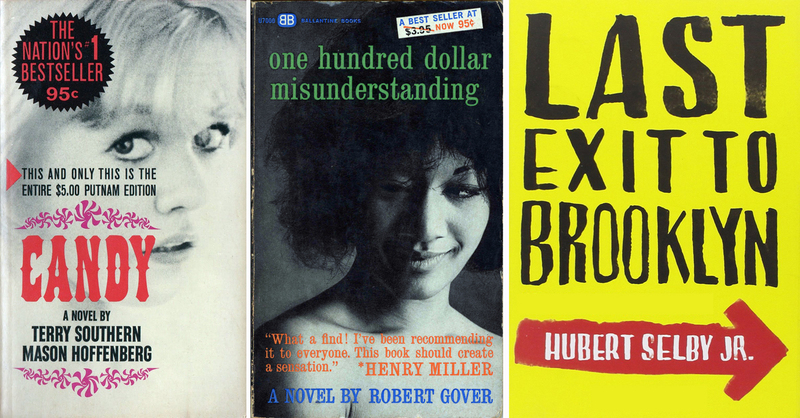 In the 1950s, there were underground jazz clubs. A fascination with the underworld is hardly a new thing. 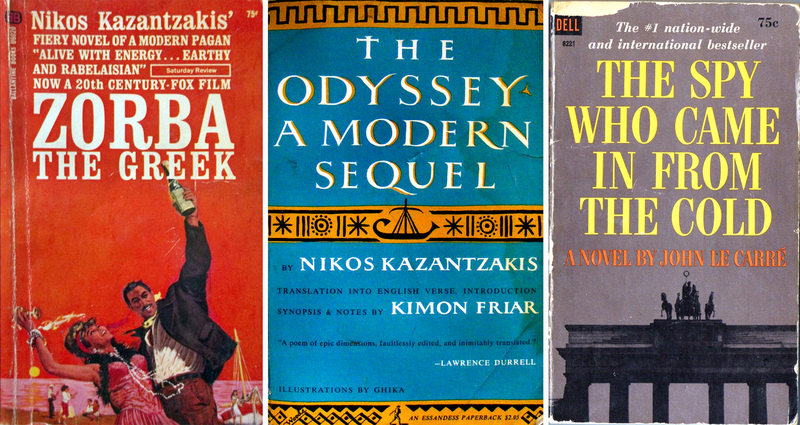 From Ulysses to Dante, we have been deeply curious about a world that seems mysterious and dark, dangerous and illicit. And even for some tourists, a visit to the sunless portions of a city is an irresistible draw. 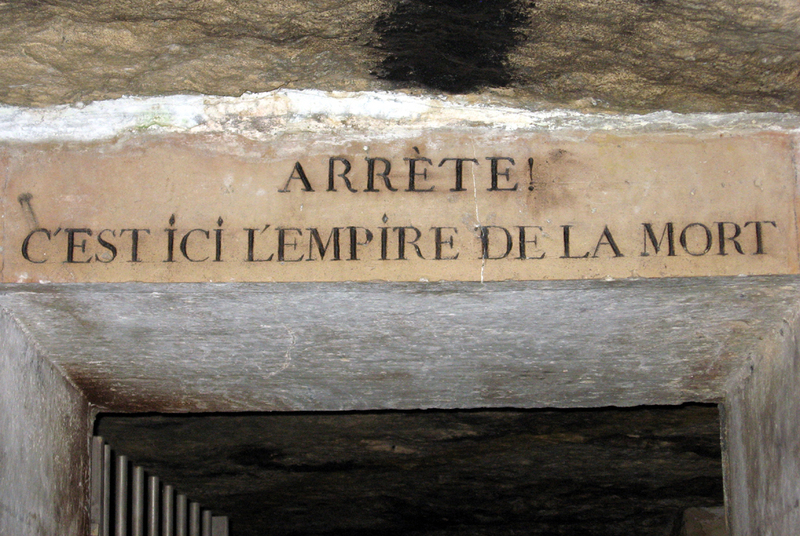 Luckily, there are legal ways to visit the subterranean Paris. When Paris was young and the Romans gave the orders, many of its important buildings were constructed of limestone quarried in the local hills. As the city grew, the quarries dug deeper into the hills, and the beige limestone city overtook its suburbs and their quarries, which now honeycomb the hills of Montparnasse and Montmartre. By 1786, Paris had grown to more than a half-million people, and there was need for fresh real estate. 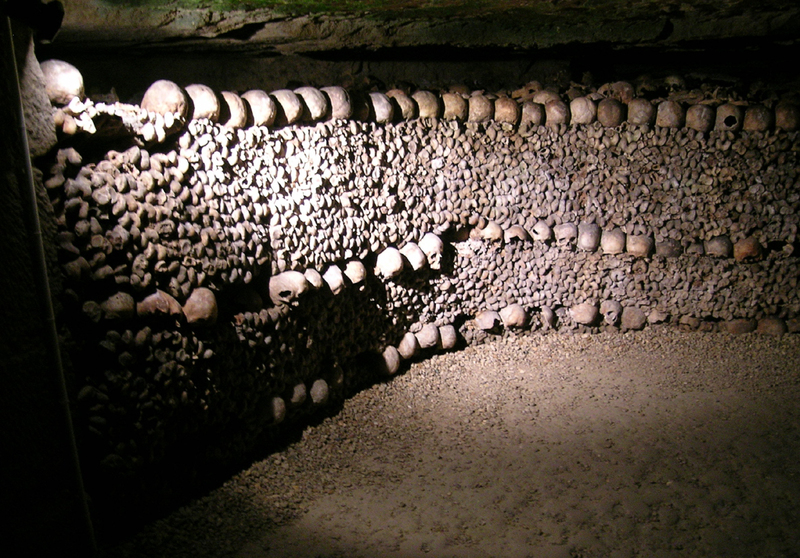 The city council decided it could empty out the cemeteries and use the land to build on, and so, from 1786 to 1860, graveyards were dug up and their bones transported to the tunnels under Montparnasse. In all, more than 5 million bodies made the move. They are an eerie sight in the dark. All that death, all those bones, all that underworld, Avernus, Chiron, Cerberus. 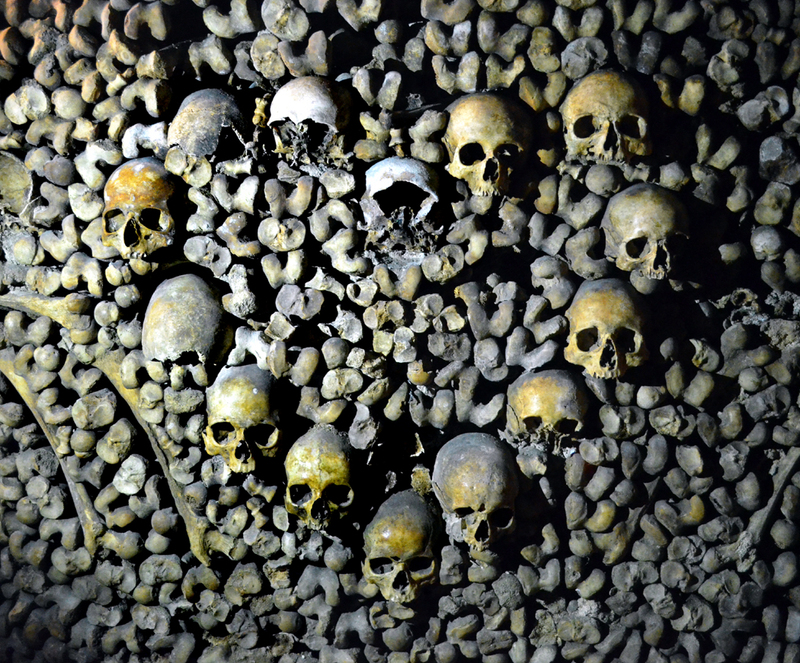 The trip through the catacombs is long and arduous, with stairs going down six stories into the bedrock of Paris, then a good half mile of twisting narrow tunnels before you ever even get to the bones. 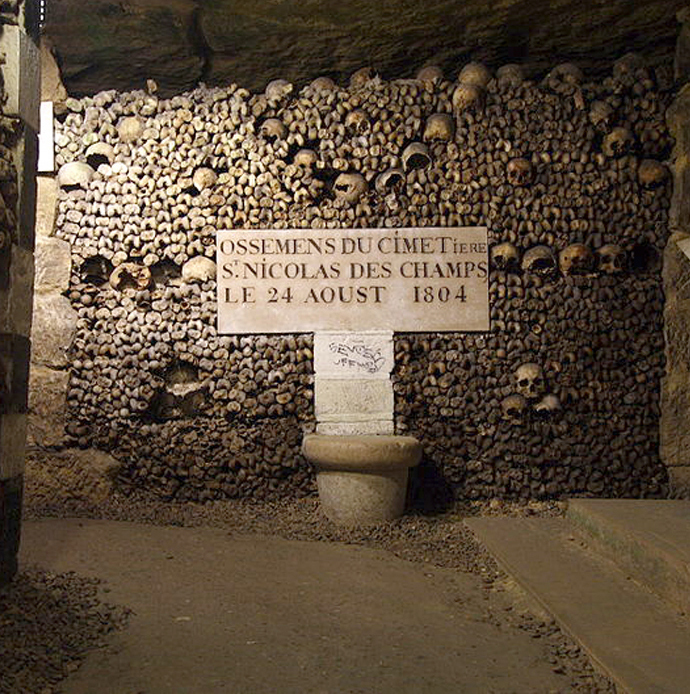 The tunnel contorts around in the underworld, with niches to right and left piled with the bones torn up from Paris graveyards. 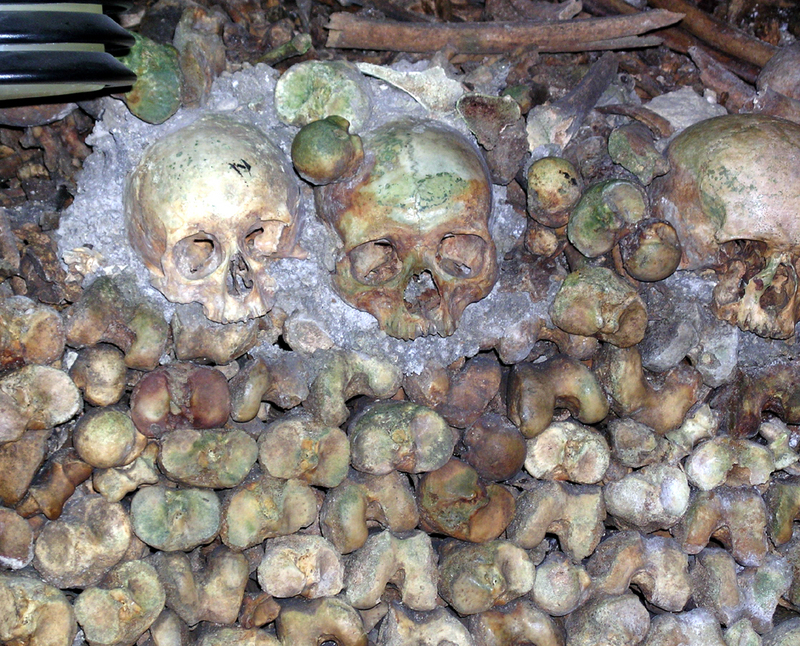 Millions of the dead from Paris’s past are piled here, with a wall of tibias and skulls making a kind of bone-dike, holding the remaining body parts behind it. Usually, the bones are assembled almost like masonry, with the knob-ends of the tibia bones left end out, and a line of skulls across them, like strata in rocks, or ornament in brickwork. The tunnels are never higher than about 6-feet and maybe 2 inches high, and only one person wide. 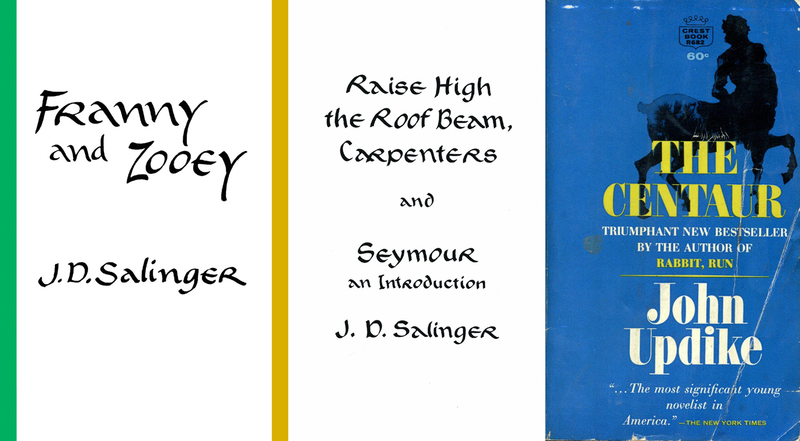 Their floors are often damp or wet with cave-drizzle. Electric lights are placed on the walls every 10 or 15 feet, but with fairly low wattage bulbs. Signs were left with the bones describing what cemetery they were disinterred from, almost like regimental monuments in a battlefield. After snaking through the underworld for perhaps a mile, you came to an even narrower spiral stone staircase with 84 steps, as the sign says, bringing you those six stories up from Hades, and you open out into a side street from a nondescript stone building-front with no markings to warn anyone this is the exit from Tartarus. The trip is a genuine experience, an encounter with history. Going through the tunnels is a completely alimentary experience. The bowels of the earth. Expelled into sunlight. 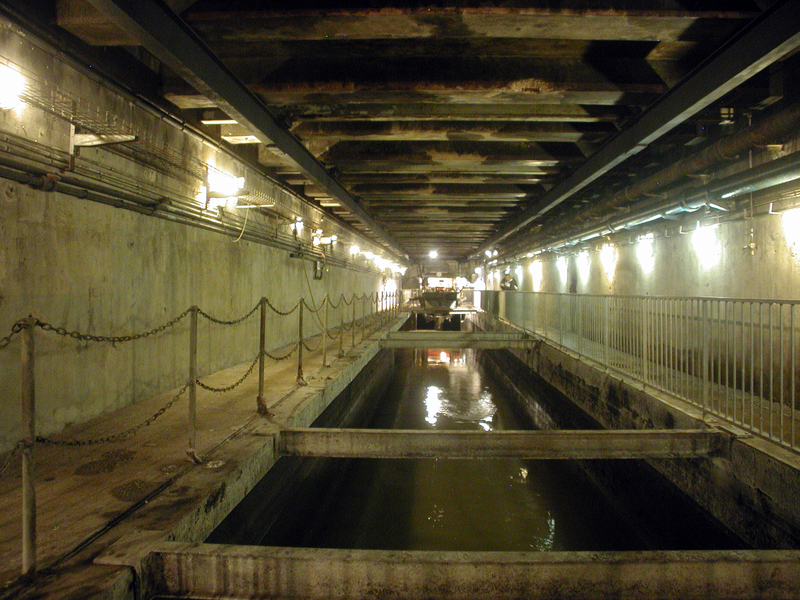 The sewer system of Paris is one of the world’s wonders. If straightened out, they could run from Paris to Istanbul. They have a place in fable and lore far exceeding that of any other sewer system in the world: They are the tunnels through which Jean Valjean carried the wounded Marius in Les Miserables. 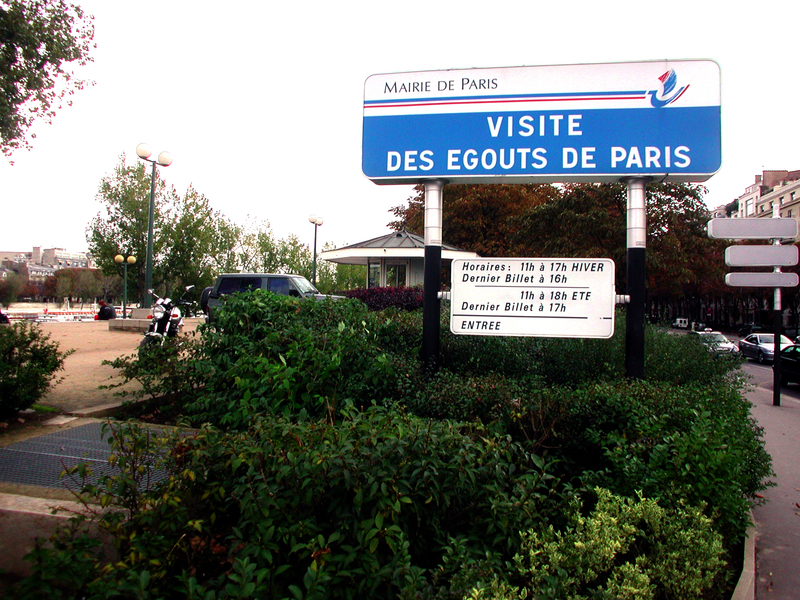 The entrance to the portion open to the public is like a tiny lemonade stand beside the bridge over the Seine. You buy tickets and descend into the depths, where a very faint odor of sewage wafts up — so faint that in a few moments, you no longer notice it. What first hits you in the darkness of the sewer tunnels is the sound, the thunderous sound of water, like a torrent over a waterfall. Part of this is the sound amplification of the tunnels, but most is the enormous quantity of water passing through the system. As you walk down one wide tunnel – more like an extended garage — the water passes underneath you as you walk over a steel mesh walkway. There are signs along the way explaining not only the sewers, but the history of the sewers, beginning in Roman times. The current system is a gift of Baron Haussmann from his city rebuilding plan of the mid 1800s. There is a kind of pulse, or bloodflow, that the system implies, a circulation system for the city. One looks at a city from above ground and sees the traffic, the shops, the restaurants, the pedestrians, the apartments above the stores, the metro stations, the statuary and monuments, but they are all just the skin of the city. Under it run the subways, the catacombs, the sewers, the remains of hundreds of years of quarrying, the abandoned tunnels of previous water and sewer lines, abandoned subway tunnels, and millions of miles of cable. And, of course, the people milling around on the surface, drinking their cafe cremes, could not exist in the city without the subsurface infrastructure. 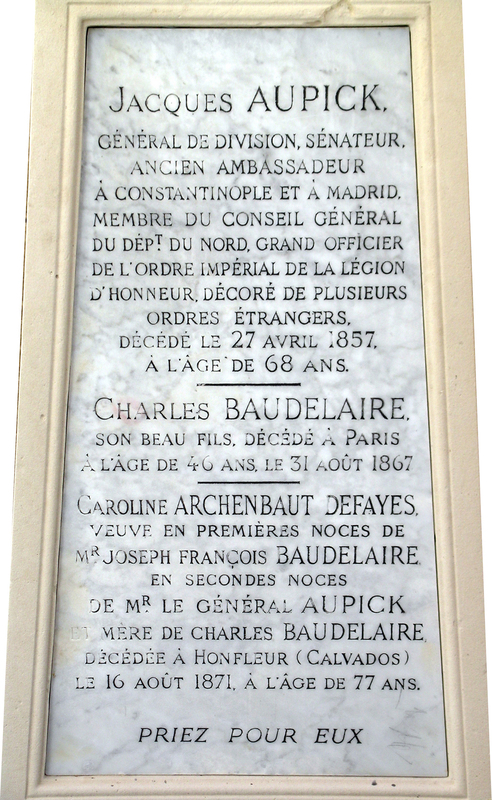 It says something about Charles Baudelaire that he is buried in a grave listed under his despised step-father’s name. It is odd, that someone as famous and accomplished as the poet was, of course, someone’s son, and part of a family, and all the wretched dynamics that implies: Charles was Petit Charles to his mom and step-dad, and even after he grew up, he seemed to remain their little boy, so that, unlike other more pompous and be-medalled Frenchmen, with their giant sepulture, with statues and trumpeting angels, he gets second billing on a plain headstone in the cimetiere Montparnasse, with his mother — who outlived him by two or three years — billed third. It is her revenge on her wayward child. 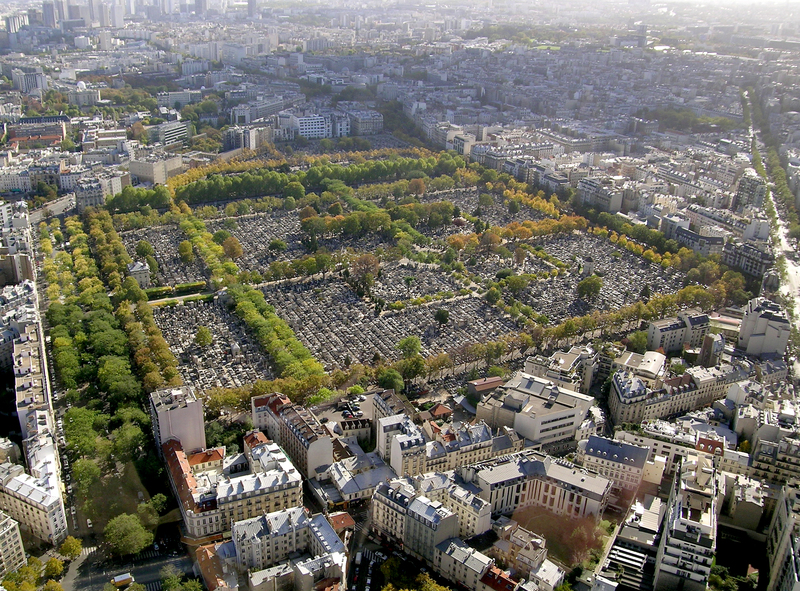 There are three large cemeteries in Paris, and they each have their celebrity tombs. 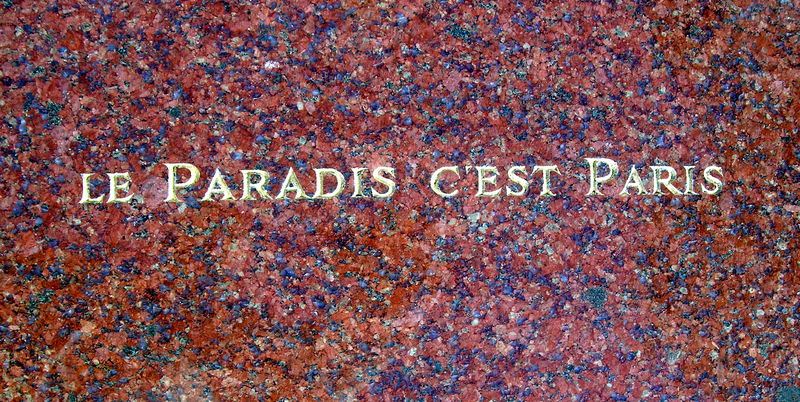 Most famous is the grave of Jim Morrison of The Doors at the cimetiere du Pere-Lachaise near Montmartre. There, you can also discover Apollinaire, Balzac, Beaumarchais, Sarah Bernhardt and Frederic Chopin. At the cimetiere de Passy you find Debussy, Manet and Joan of Arc. Visiting the cimetiere Montparnasse leads one to discover things about personages that one might not have guessed: Henri Langlois, who ran the Cinémathèque Française, has a gravestone filled with publicity photos from scores of movies; Jean-Paul Sartre and Simone de Beauvoir share a headstone with only their names and dates; actress Jean Seberg has a simple flat stone grave with a tiny headstone with her name in a badly written script, as though done by an amateur. Many small stones had been left on the sarcophagus lid. Paradise, but also the underworld.